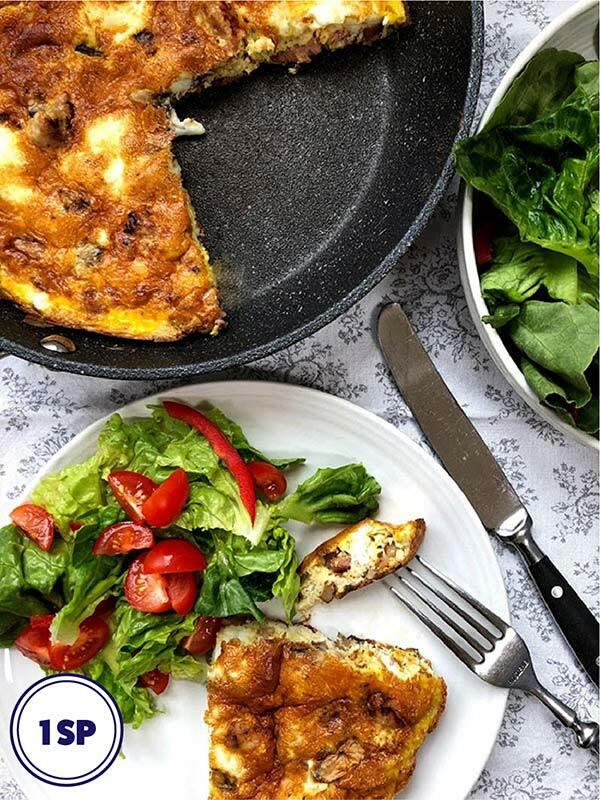 This Sausage, Bacon & Mushroom Frittata is just 1 Smart Point per portion on the Weight Watchers Flex / FreeStyle plan. It is easy to make and can be served with a simple side salad for a filling and tasty lunch. 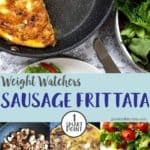 Since eggs became zero heroes on the Weight Watchers Flex / Freestyle plan, I have become a great fan of Frittatas! They are filling, they are tasty and what is more they are very easy to make. One portion of this Sausage, Bacon & Mushroom Frittata (a quarter of the whole thing) is just 1 Smart Point. It is really filling, but if you were feeling particularly hungry you could have half the Frittata for just 2 Smart Points! That is crazy! When I make this Frittata, I often eat the remainder for breakfast over the next couple of mornings. It kind of reminds me of a Full English Breakfast! It keeps well in the fridge and can either be eaten cold or can be warmed through before eating. 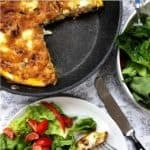 If you like Frittata you also may be interested in this recipe for Salmon, Pea and Horseradish Frittata. 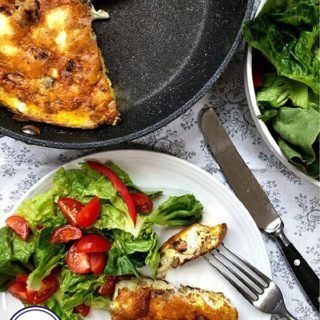 One of the secrets of making a good frittata is to use a good quality non stick frying pan/ skillet. The pan needs to be oven proof so that you can place it in the oven to cook the top of the Frittata. I use a 20cm Eaziglide pan which is very hard wearing, bona fide non stick and not too heavy. 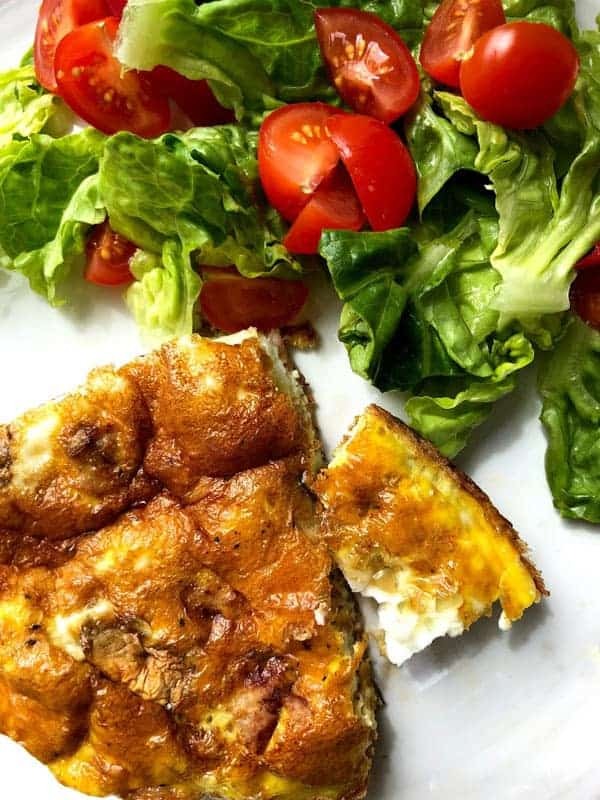 This filling and tasty frittata is just 1 Smart Point per portion on the Weight Watchers Flex / Freestyle plan. Use 10 sprays of frylight in a medium sized oven proof frying pan. Add the chopped sausage and fry for 8 minutes until the sausage has browned. 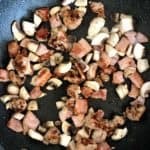 Add the chopped bacon medallions and fry for 2 - 3 minutes before adding the chopped mushrooms. Cook for a further 3 - 4 minutes until the mushrooms have softened. 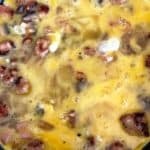 Whisk the eggs, season with some grated black pepper and a little salt (remember the bacon will be salty) and pour the whisked eggs over the bacon, sausage and mushrooms. Cook over a low heat for 8 - 10 minutes until the frittata has almost set. Place the pan under the grill and cook the top of the frittata for another 3 - 5 minutes until it has set and has turned golden brown. Serve warm or cold with a side salad.